Coconut oil has many incredible advantages for skin and hair . Coconut oil is bursting with antioxidants and useful nutrients to nourish skin and hair, and helps the skin to protect itself from damage as well as to heal itself. Moreover, it has a luxuriously pleasant buttery consistency at room temperature making it easy to use and apply. It is antiseptic and helps control skin conditions like eczema and psoriasis as well as scalp problems such as cradle-cap and dandruff. Its effects as a hair conditioner  are legendary. Coconut oil, like olive oil, is not cheap when viewed as a cooking oil (though it is wonderful for this too). But it is so very rich in its benefits that you need to use only small amounts at a time. And when compared to the products it replaces, it is indeed cost effective. Coconut oil is the unrefined oil extracted from the fruit of the coconut palm (Cocos nucifera). It has a high melting point of 24°C (76°F), below which it has the consistency of hard butter, and a high smoke point of 180°C (360°F). It keeps for long periods (easily a year or more) without turning rancid. Coconut oil is mostly made up of saturated fats, nearly half of which is lauric acid. It is by far the richest food source (at 62%) of medium chain triglycerides (MCTs), which stimulate the thyroid, increase metabolism and are very easily digested, putting less strain on the liver, pancreas and digestive system. This is because, unlike other fatty acids, MCTs can be absorbed directly by cell membranes and do not require enzymes to break them down. Lauric acid in particular is essential in boosting the body’s immune system, especially in fighting viruses such as influenza and even HIV. Coconut oil has a small molecular structure, enabling it to be absorbed by the skin easily. Unlike other oils, it even penetrates hair fibres to protect, nourish and soften hair. It has a similar make-up to the skin’s own oil, sebum, which also consists of MCTs. It helps maintain the elasticity of the skin’s  connective tissues and its antioxidants fight the damage caused by free radicals. Like olive oil, virgin coconut oil is extracted simply without being chemically processed and so retains its benefits. It can even be made at home . The shredded flesh of the coconut is squeezed or pressed to extract the abundant coconut milk. This is then allowed to separate naturally and the oil skimmed off (the traditional method), or it is separated by centrifugal force. It is often gently heated to drive off excess moisture. Alternatively, the shredded coconut meat is first dried and then pressed, expelling the pure oil. Most coconut oil (90%) is produced by the 17 Asian and Pacific Coconut Community countries of the tropics, with the Philippines being the biggest producer. Refined, bleached and deodorised (RBD) coconut oil is also produced, but has no coconut taste or smell and has been chemically refined. It is used for cooking, in industry and pharmaceuticals. Coconut oil is also sometimes hydrogenated, producing harmful trans fatty acids. This is done to increase its melting point for use in foods such as chocolate that may otherwise melt in warm climates. Coconut oil traditionally forms the primary source of fat in the diets of the people of the tropical regions. It is a good choice of cooking oil with a high smoke point of 180°C, and is very resistant to turning rancid. It can also be added to many desserts and sauces, and because of its high melting point can be eaten as a spread. Its inclusion in the diet, especially to replace other less healthy fats, has a number of health benefits, including boosting the immune system, helping the digestive system, increasing energy levels and lowering blood pressure. Many of the benefits of coconut oil derive from its richness in lauric acid, which is converted by the body into monolaurin. This is one of the most important substances used by the immune system in fighting viruses, bacteria and protozoa. Coconut oil is a rich source of antioxidants such as vitamin E, and helps the body to protect itself from cancer internally and at the skin. Its abundant medium chain fatty acids (MCTs) help the thyroid, stimulate the metabolism and assist in managing diabetes. See here  and here  for more about how and why coconut oil benefits health. 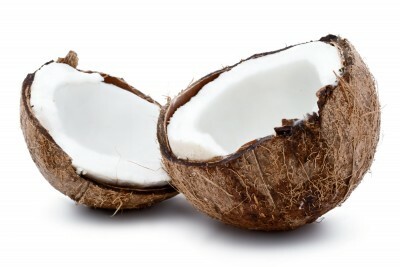 Coconut oil is used as a biodiesel engine fuel in tropical island countries such as the Philippines. It also functions as an engine lubricant and transformer oil. It can be used to make herbicides for controlling weeds without harming the environment. The coconut is an ancient plant which has spread across most of the tropics. The buoyant, water resistant fruit can travel long distances by sea to disperse its seed. Its spread was probably also often aided by early seafaring people, who would have taken it on voyages as a valuable crop for any new land, as virtually every part of the plant can be used. The oil has been used as a food and medicine by the people of the tropics for thousands of years. Its uses in Ayurvedic medicine in all areas of the mind, body and spirit are documented in Sanskrit from 1,500 BC. It became more commonly available in Europe and the USA after WWII, until saturated fats fell from favour in the mid-1950s. From the 50s, the link between saturated fats, cholesterol and coronary heart disease (CHD) was used to explain rising rates of CHD, especially in the USA. This link was based on over-simplified conclusions and limited research but received massive funding and marketing support from the soy bean and corn industries. Together with the American Heart Association they were committed to change the American diet to substitute saturated for polyunsaturated fats. This so-called “Prudent Diet” was hugely successful at selling especially refined vegetable oils, and even convinced small island nations in the South Pacific to abandon their age-old traditions and import polyunsaturated oils. It achieved nothing for the health of Americans or the world, however. CHD is still on the increase, along with myriad other health problems. While too much saturated fat from animal sources can indeed be harmful, some saturated fat is necessary for good health. Furthermore, not all saturated fats are the same, and tropical oils, especially coconut, are in fact extremely healthy. The chemical make-up of coconut oil is unique in its richness of medium chain triglycerides (MCTs). The many benefits of MCTs are discussed above; ironically one is a reduction in coronary heart disease. Copyright © 2010 spotless. All rights reserved.